I encountered – “hands-on” – an emerging phenomenon called “interactive art” on my first visit to the Ars Electronica festival (Linz, Austria) in 1989. One of the works on display was Deep Contact, a laserdisc installation by the American artist Lynn Hershman. Sitting in front of a display, the user was invited by (the image of) a seductive young lady to “reach through the screen” and touch her. By means of a touchscreen interface, the spectator-turned-into-interactor responded, entering various realms, including a kind of garden of earthly delights, where s/he chose forking paths and encountered erotically loaded incidents along the way. Another installation was The Legible City by Jeffrey Shaw. By means of a stationary bicycle, like the ones at gyms, the visitor entered a virtual city consisting of letters, words and sentences. Choosing one’s routes through the spatialized database, one engaged in simultaneous acts of reading and writing with the combined efforts of one’s eyes, hands, and feet. I still remember the intoxicating feeling of diving under a giant letter “A”, or the sensation of virtually crashing through entire words. These experiences raised questions in my mind: what does cruising between and under letters, and even penetrating them, mean? What is the ontology of such experiences? Am I inside language, or even beyond it? Or inside someone else’s mind? Confronted with such uncanny issues, I had a feeling that something “new”, perhaps even the “ontological rupture” touted by virtual reality enthusiasts, was in the making. In the years to come I had an opportunity to experience many other interactive works as well, to the extent that a new phenomenon, at least a genre, seemed, indeed, to be emerging. Many of these works have since been canonized as ‘classics’ of interactive art – at least at events like Ars Electronica and Siggraph and institutions like the ICC in Tokyo and the ZKM at Karlsruhe, although hardly in the ‘Art World’. Beside the works by Hershman and Shaw, already mentioned, a representative list would include Myron Krueger’s Videoplace, David Rokeby’s Very Nervous System, Ken Feingold’s The Surprising Spiral, Agnes Hegedues’ Handsight, Grahame Weinbren’s The Erl King and Sonata, Luc Courchesne’s Portrait One: Marie, Christa Sommerer’s and Laurent Mignonneau’s Interactive Plant Growing and A-Volve, Michael Naimark’s Be Now Here, Perry Hoberman’s Bar Code Hotel, Paul Sermon’s Telematic Dreaming, Toshio Iwai’s Piano as Image Media, Paul DeMarinis’ Raindance, Rafael LozanoHemmer’s Vectorial Elevation, and so on. As familiar as these names are for those insiders active within the realm of art and new technology (or “media art”), they probably say little to most critics, curators and audiences operating within the established museum and gallery circuit. As different as these works were in their approaches, they had something in common: they used computer technology, and were supposed to be ‘activated’ by the user. A physical-tactile effort from the part of the visitor was required to make them function and reveal their potential for generating meanings. By clicking a mouse, rolling a track-ball, waving one’s hand, jumping, shouting or pedalling a training bicycle the user was asked to “realize” or “complete” the work that “would not exist” without his/her actions. The active role of the spectator, turned into a ‘user’ or an ‘interactor’, was essential. The aim was to empower and challenge the visitor to go beyond the modes of usual spectatorship – the contemplative and passive attitude of the art lover standing in front of a painting or a statue. Of course, the reception of all art can be claimed to be “active” (an argument frequently used by traditional art critics in their invectives against interactive art). However, this active perception-interpretation only involves the eyes and the brain. Interactive art added to these a haptic dimension: the visitor was not only allowed, but required to touch the work. The touch – often physical, but sometimes “virtualized”, mediated by a videocamera or a microphone, was essential. Whether stated explicitly or merely implied, “Please Touch” – an echo of Duchamp’s ambiguous exhortation “Prière de toucher” – became the cornerstone of the aesthetics of interactive art. The “user interface” was where the encounter between the work and the user took place. 1Duchamp used the text "Prière de Toucher" on the inner cover of the exhibition catalogue Le surrealisme en 1947 which he designed. The cover of the de-luxe edition of the catalogue had a foam-rubber breast. See Marcel Duchamp, edited by the Museum Jean Tinguely Basel, Ostfildern-Ruit: Hatje-Cantz, 2002, 134-135. Ken Feingold referred to Duchamp’s work in the book-looking touch-screen interface of his installation The Surprising Spiral (1991). The on back of ‘the book’ there was the name "Pierre de Toucher," supposedly its ‘author’. For a more detailed analysis, see the author’s "Twin-Touch-Test-Redux: Media Archaeological Approach to Art, Interactivity and Tactility," to be published in Media Art Histories. Edited by Oliver Grau. Cambridge, Mass: The MIT Press, 2005-06. In retrospect it is easy to see the line of development that connected these works to the idea of “interactive computing” that began to form itself in the 1960s. Innovations like time-sharing, artificial intelligence, interactive computer graphics, visual displays and new interface devices like light-pens, joysticks and the mouse inspired visionaries like Alan Kay, Doug Engelbart, Ted Nelson and Nicholas Negroponte to see the relationship between the user and the computer as an increasingly symbiotic affair: both shared a “common ground” and would eventually learn from each other as the interaction continued, deepened and got ‘smarter’. Artists, like the ones mentioned above, were inspired by such prophesies, taking the human-computer interaction to higher and more adventurous levels. However, they did not take it at face value, often deliberately adding complications, limitations, disturbances and ‘noise’ to the system. Some of them questioned the over-emphasis of the virtual, stressing the physical component of the interaction process, the body that was not quite left behind, at least yet. Some criticized the ideal of simplified one-to-one interaction often found in commercial and industrial applications. Many of the early works could already be characterized as ‘metacommentaries’ on interactivity, as I proposed years ago. 2See my "Seeking Deeper Contact. Interactive Art as Metacommentary," Convergence, Vol.1, N:o 2 (Autumn 1995), pp. 81-104 (University of Luton & John Libbey, U.K.). The early “interactive artists” made critical contributions to the emerging discourse on interactivity. Although for many observers it was unknown before it was picked up by the mainstream media as a new buzzword, “interactivity” had already been a force in Western culture for some time on various levels from military applications to entertainment. But this is not the whole story. The genealogy of interactive art is much more complex, although it can only be touched upon briefly here. In a wider sense “interactive media” is an outcome of the history of the human / machine relationship that goes back to the industrial revolutions that began in the second half of the eighteenth century. Partly to compensate for the monotony of the work with factory and office machines, partly to profit from their “attraction value” as tokens of a new era, scores of “protointeractive” devices were introduced for both public and private use in the nineteenth century. 3See my "Slots of Fun, Slots of Trouble. Toward an Archaeology of Electronic Gaming," in Handbook of Computer Games Studies, edited by Joost Raessens & Jeffrey Goldstein, Cambridge, Mass. : The MIT Press (forthcoming 2005). At homes, ‘philosophical toys’ like zoetropes and praxinoscopes – a major inspiration for interactive artists like Toshio Iwai – encouraged the user to develop a playful and intimate relationship with optical technology. Such devices allowed the user not just to manipulate the images, but to create one’s own ‘software’ for them. Iwai’s Elektroplankton (2005), created for Nintendo’s DS game console, may technologically be a far cry from a 19th century phenakistiscope, but conceptually there is a link. At public places, vending machines, strength testers, mutoscope-like peep viewers and arcade games provided a tempting and pleasurable way of interacting with machines. These ‘counter machines’ evoked the experience of using machines in the working life, and yet they were different. They may have used all their persuasive power as attractions to make one spend all the coins in one’s pocket, but the initiative – and the pleasure – belonged to the user. Artists like Toshio Iwai, Michael Naimark, Ken Feingold, Catherine Richards, Heidi Kumao and Ellen Zweig, to mention just a few, have been highly conscious of this lineage, frequently referring to it in their works. Interactive art also has numerous precedents in experimental art from Marcel Duchamp’s Bicycle Wheel and Rotoreliefs, Thomas Wilfred’s Lumia machines (such as his Clavilux Junior) and Frederick Kiesler’s radical exhibition designs to Fluxus happenings, Jean Tinguely’s La Rotozaza I, Nam June Paik’s Participation TV, responsive “cybernetic” sculptures and closed circuit video-installations. Often the artists involved in “proto-interactive” developments have been influenced by popular cultural forms at fairgrounds and amusement arcades (indeed, these have provided favourite references for conservative critics writing about interactive art – the gallery has been “turned into a playground”, etc.). The invitation to touch has connoted disrespect and reckless pranksterism, but also a critique of culturally and institutionally sanctioned ‘high art’. This was playfully expressed in the installation Zerseher (Iconoclast) by Joachim Sauter and Dirk Lüsebrink (awarded a prize at Prix Ars Electronica 1992). By means of state-of-the-art eye-tracking technology, the user’s gaze was empowered to ‘destroy’ a classical painting (actually, its digital replica). Such genealogies apply well to the ‘interactive classics’ listed above. Having visited Ars Electronica regularly (with only one exception) since 1989, it has become evident for me that things are changing. Interactive Art has been a category of the prestigious Prix Ars Electronica competition since 1990, and many of the artists mentioned so far have walked to the podium to claim their Golden Nica (or one of the lesser distinctions). Particularly during the past two years, however, the top awards in the Interactive Art category have gone to works that have little, if anything, to do with interactivity as it used to be known. Of course, this may be partly the result of Ars Electronica’s policy of shuffling the members of the various juries from year to year. This procedure is meant to work against the formation of orthodoxies and fixed definitions. In a sense “interactive art” is always what the current year’s jury deems it to be. The juries also look for “trends” and “tendencies” and use these as backdrops for their decisions. Clearly this does not happen in a vacuum: as their statements show, the juries are aware of the decisions and definitions by their predecessors. So how and why does the definition of “interactive art” change? I will try answer by looking at the prize winners from 2004 and 2005 , as well as the juries’ comments. In 2005 the Golden Nica was given to a ‘locative media’ project entitled MILKproject by Esther Polak (Holland), Ieva Auzina (Latvia) and RIXC, the Riga centre for new media culture. The project documents the way along which milk travels within the recently enlarged European Union from Latvia to the Netherlands, being transformed into cheese and finally reaching the mouths of the Dutch consumers. The team followed the “milk line”, lending all the contributing subjects – from farmers to drivers – GPS equipment for a day. The global positioning data was then projected in graphic form for the participants themselves and reviewed in collective feedback sessions. There is no doubt about the project’s ambition. It is conceptually clear, meticulously realized and politically correct within the European context. It also reflects the current trend of GPS-based locative media projects, as the jury noted in its comment. However, categorized as “interactive art”, MILKproject is problematic. Its main claim to being ‘interactive’ seems the use of GPS for ‘drawing’ the ‘milk trajectory’ as it gradually emerges from the mundane routines of the participants, as well as the idea of asking these to reflect on their own experiences and including this as a layer of the work. However, used in such a way, the GPS does little more than take the place of photography, film or video, long used by cultural anthropologists and sociologists to docúment and understand the protagonists’ own perspectives. Sol Worth’s and John Adair’s classic Through Navajo Eyes researched the Navajo way of seeing the world by giving film cameras to the Navajos themselves and paying attention to their interpretations of the footage. Collective feedback sessions of the film footage already shot were often used in Hungarian etnographic documentaries of the 1970s and 80s, and so on. All this does not diminish the value of MILKproject, which nevertheless breaks new ground. The main objection is its mode of presentation: it was shown as a traditional ‘passive’ screen-based gallery installation that gave the audience no ways of ‘talking back’ or even selecting which aspects to focus on. There was no access even to the project website, which is really only a documentation that does not differ from thousands of other sites in its modes of interaction. The year before (1994) the Golden Nica went to Ben Rubin’s and Mark Hansen’s Listening Post, an ambitious and impressive installation that had already been shown at prestigious art institutions like The Whitney Museum in New York and even lauded by more traditionally minded critics. It is certainly a work that deserved a prize, but did it deserve it in the Interactive Art category? That is the question. The answer may have consequences for the very definition of interactive art, and perhaps even to its raison d’être. For judged by the standards of the ‘interactive classics’ mentioned above, there is nothing interactive in Listening Post. The audience stands, sits or lies in front of a large curved grid supporting 231 little electronic text displays. 4At Whitney Museum it was also possible to walk around the structure, I was told by Mark Hansen. The lighting in the room at Ars Electronica was darker than in some other venues, making the effect of the work more dramatic. Various text fragments, captured from the innumerable chat rooms of the Internet, keep on appearing on the displays, selected by a computer program written by the artists. Words are enunciated by a synthetic voice, and occasional musical accents have been provided. Some people I talked to described their experience of Listening Post in near-religious terms as meditative, sublime and elevating – watching the words endlessly appear and disappear and listening to the subtle declamation of the synthetic voice was experienced as hypnotic and captivating. It was easy to be lulled into a trance-like state, forgetting the passage of time and the surroundings – in spite of the fact that Rubin and Hansen emphasized in the talk they gave at Ars Electronica the reality effect brought by the soundbites (references to the on-going Beslan hostage crisis kept on appearing from time to time when the installation was being shown at the Ars Electronica prize winners’ exhibition). Someone compared the experience to the cinema – facing the luminous wall of displays, many visitors chose to sit and watch in silence. Although some people did approach the work and even went behind it, there was no way of having an effect to the unfolding of the text. Indeed, even the artists’ control was limited to writing the computer program and setting up the system. Like a deus otiosus, the idle god, the artist left the work to evolve on its own, which is of course a thought-provoking decision. Yet, this being the situation, it is quite legitimate to ask: where is the interactivity? In which sense can this work be classified as interactive art? The jury defines its “expanded definition of interactivity” by formulating three criteria: (1) mediation by computer is not a requirement, (2) constraints of “real-time” and directness of interaction should be relaxed, and (3) passive interaction will be allowed. As a consequence, the “reception and contemplation of an ‘interactive work’ may not require the ‘active participation’ that was so crucial to the earlier stages of the development of the genre.” 6Ibid., 106. The jury had reviewed the earier jury statements, noting the broadening of the field and its changing definitions. It seems, however, that the criteria proposed by the 2004 jury present the most radical challenge to the “old school” of interactive art. Not only is using digital technology no longer a requirement. The need for real-time interaction between the user and the system has been “relaxed” and the idea of “passive interaction” (a contradiction in terms) enforced. Taken together, these amendments may easily lead to the conviction that “old school” interactive art has had its day and is in the process of being replaced by something else, the outlines of which we don’t yet quite perceive. If this is so, wouldn’t it be best to give up the label of interactive art altogether – or save it to the “old school” work emphasizing direct active interaction between the user and the piece – and replace it with something else? As all this shows, the “expanded” definition of interactivity formulated by the Prix Ars Electronica 2004 jury was not totally unprecedented. Why did I, as well as a number of other seasoned Ars Electronica participants, react so strongly against giving Listening Post an award in the Interactive Art category? Because the work excludes the issue of user interaction across an interface altogether. The interaction with this work is entirely mental, like the experiences of a cinema spectator or an art lover meditating in front of Leonardo’s Last Supper or Giorgione’s The Tempest. Of course, the Listening Post is an ‘alive’, constantly metamorphosing multimedia environment, but one might argue that this does not dramatically change the constitution of its observer. There is nothing else to do beside watching, listening, and immersing oneself into the experience. The automated, predefined functions of the software analyzing the elusive network traffic have been given center stage. The outcome is displayed in a highly “aesthetized” form. Of course, there are other humans present beside the spectators: the anonymous subjects occupying Internet’s countless chat rooms at any moment. However, their input is treated merely as raw material for a manifestation of database aesthetics, in its programmed basis a statistical operation. The individual voices are not singled out, nor are their originators made aware of their participation in the artwork. Indeed, this work could perhaps be read as a contribution to the controversial discourse on “collective intelligence” developed by Pierre Lévi for years. Of course, as the jury attempts, one may look for a way out by talking about “system interaction”. Indeed, “system interaction” has been a prominent feature of such important recent works as Ken Rinaldo’s Autopoiesis and Rokeby’s (n)Chant. Although these works accept input from human participants, the processes happening internally between the various network ‘nodes’ within these works (in Rinaldo’s case, a flock of robotic creatures able to sense each other’s presence and reactions, as well as to receive stimuli from the outside) are at least as interesting and challenging. However, when the active human input is totally lacking, as in the case of Listening Post, the work constitutes a system that could be characterized as autonomous. A bit like antique automata – even while it incorporates unpredictable elements from the Internet – the work performs certain pre-choreographed actions to the enchanted spectators kept at a distance. In the field of the media arts we have encountered numerous works that have functioned like this, from László Moholy-Nagy’s Licht-Raum Modulator to Jean Tinguely’s motorized sculptures and Harold Cohen’s Aaron, an expert system creating drawings and paintings at least semi-autonomously. 9Cohen has created the system and written the AI-influenced software. He sets the parameters and starts the painting process that continues from then on autonomously. Cohen claims that he cannot control the outcome of the painting process in advance. In a sense, Cohen’s role is not different from that of the mainframe computer operator of the early times. He sets the problem, starts the operation and inspects the result. He does not interact continuously with the system while it is functioning. All these, and many other works, have been based on the principle of “system interaction”, but until now labeling them as interactive art hasn’t been even proposed. Indeed, system interaction as such could be claimed to be the opposite of user interaction. It deliberately marginalizes the active participation of the user, placing the machine and its operations in the centre. 10A classic discussion of these issues is Jack Burnham’s Beyond Modern Sculpture, New York: George Braziller, 1968. In fact, “system interaction” may be just a new label for a phenomenon that used to be known as the way a “cybernetic organism” functions. Cybernetics, of course, refers to the modes of communication and feedback within complex systems, both human and technological. Autonomous cybernetic operations have become part of the functioning of any digital system, including interactive ones. That, one could claim, does not warrant calling any cybernetic system interactive. If the word interactive is to retain anything about its former distinctiveness, it should, perhaps, be after all reserved to cases where active and repeated user-intervention plays a significant role in the functioning of the system. From such a perspective, computer and video games are clearly an interactive medium; games relying entirely on “system interaction” would be an absurd idea, while system interaction is always an essential element of their architecture. Of course, interactive art can – and should – stretch the definition of interactivity and explore its limits, but I still feel that the issue of user interaction should remain an essential part of its territory. In this sense another of the award winners at Ars Electronica 2004, Osman Khan’s and Daniel Sauter’s We interrupt your regularly scheduled program, was an interesting test case. The work transforms the television program flow to an abstracted digital stream of pixels (seen as if emanating from a TV set facing the wall). The user’s role is limited to switching TV channels with a remote controller. In spite of its minimal and deliberately ‘banal’ character, this is a meaningful – and interactive – gesture within the aims and thematic concerns of the work. Sure enough, this does not solve all our problems. There are problematic cases, like Ken Rinaldo’s Augmented Fish Reality that received the jury’s distinction in 2004. Two Siamese fighting fishes inhabiting separate fish bowls placed on motorized platforms with wheels. By interrupting laser beams crossing the bowls the fishes can “drive” their bowl-worlds around the room. Amazing, but is it interactive art? One might reason that the fishes are surrogates for human interactors, which would qualify the work at least as a “meta-interactive” piece. Much the same could be said about interactive performances, like Golan Levin’s and Zachary Lieberman’s Messa di Voce (Honorary Mention 2004). The audience of this work, which was seen as a stage performance at Ars Electronica 2003, is merely observing the actors useing their voices to create and manipulate visuals, empowered by a dedicated software written by Levin and Lieberman. However, unlike Rinaldo’s Augmented Fish Reality, Messa di Voce can also be turned into an “old school” interactive installation, where the audience takes the place of the professional actors. The work was successfully shown in this form as part of the Ars Electronica 2004 exhibition. Should we see these as two different works based on the same software, or just two variations of the same? What is the role of the context and the role of the observer/interactor? I will leave these questions deliberately open for the time being. Another factor that complicates things is the Internet. Interactive installations began started as a genre before the Internet made its breakthrough as a “universal” medium in the second half of the 1990s. The modes and definitions of interactivity in network communication seem quite different, and possibly more complex, than those explored by the early “interactive artists”. Network interaction combines features from modes of human-machine interaction, as well as from discourses and traditions of social interaction. How these merge with each other into a ‘network-specific’ mode of interaction (and whether this happens) is current far from clear. So far there have been relatively few works that have successfully managed to combine “remote interaction” on the Internet and “local interaction” within a physical space. Rafael Lozano-Hemmer’s Vectorial Elevation (Golden Nica 2001) attempted to do this on an extraordinarily ambitious scale, empowering the Internet users to control a cluster of robotic searchlights around Mexico City’s main Zocalo Square. However, while the Internet part was truly innovative and interactive, the audience on the site was offered an ephemeral but nevertheless a spectacular lightshow, with practically no control mechanisms or feedback channels at hand. 11See my "Re-Positioning Vectorial Elevation. Media Archaeological Considerations," in Rafael Lozano-Hemmer: Alzado Vectorial. Relational Architecture No.4, Mexico City: Publications Department, National Council for Culture and the Arts (Mexico), and Impresiones y Ediciones San Jorge, S.A. de C.V., 2000, 98-113. Lozano-Hemmer was aware of the issue, and tried to solve it be installing public Internet terminals in some public spaces. Although a remarkable tour de force, the gap between “those who have and have not access” was not bridged satisfactorily. At Prix Ars Electronica, Internet-based projects have often been excluded from the interactive art category, reflecting the difficulties of creating and maintaining definitions. Listening Post clearly deserved an award, but not the one it got. Perhaps “Net Vision” would have been a better category – if only the Net Vision jury had not had a totally different agenda in which ‘art’ played a relatively peripheral role, compared with socially and ideologically oriented ‘applications’. “Net Excellence” did not suit either. The time may have come to re-define categories. Constantly stretching the definitions of interactive art as the Ars Electronica juries have done causes more confusion than clarity. As already stated, it might be suggested that “interactive art” as a category would be reserved for works where the issue of user interaction plays a significant role. Perhaps an entirely new category should be created for works like Listening Post. “Cybernetic art” it cannot be, “system art” it should not be. “Intra-active art” would sound too hermetic. “Database aesthetics” might be a viable candidate, as it is already in use and would by-pass the difficulties associated with concepts like user interaction, passive interaction and system interaction. More database-related work is already on the way. It is also possible that the category of “interactive art” itself should be abandoned. Perhaps it made more sense in the era of the pioneers, for whom “user interaction” itself was uncharted territory. Today interactive media is everywhere; its forms have become commonplace. It might be wise to turn attention from the modes and technologies of interaction to the themes and topics they can serve, highlight and criticize. Professor Erkki Huhtamo’s recent work has dealt with media archaeology, an emerging approach he has pioneered (together with others, like Siegfried Zielinski) since the early 1990’s. Media archaeology excavates forgotten, neglected or suppressed media-cultural phenomena, providing us a powerful “tool” for assessing the phenomena underlying media history. Huhtamo pays particular attention to the “life” of topoi, or the cliched, commonplace elements providing “molds” for experience in different times and places. What is “new” in media culture can, paradoxically, often be discovered by excavating what is – seemingly – self-evident and obsolete. In recent years, Professor Huhtamo has applied this approach to phenomena like peep media, the notion of the screen and mobile media. In October 2005 he gave an invited lecture at REFRESH! The First International Conference on Media Art Histories, Science and Technology (Banff, Canada), analyzing the ways in which contemporary media artists have applied media-archaeological approaches. In December 2005 he will give, together with the acclaimed media artists Golan Levin and Zachary Lieberman, a lecture / performance in Tokyo, inspired by the late 19th century “lightning sketches”. 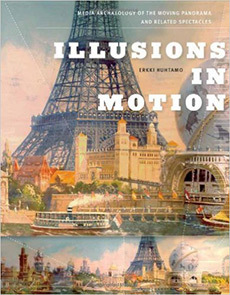 Professor Huhtamo is currently working on two books, one on the moving panorama as a forgotten mass medium of the 19th century and the other on the archaeology of interactivity. He is the editor (together with fellow UC professors Doug Kahn and Margaret Morse) for a new book series entitled “Technoculture and the Arts” for the University of California press.